March 7, 2010 - DART Helicopter Services announced that their subsidiary partner Apical Industries Inc., received Transport Canada approval of their Cylindrical Emergency Float Systems with & without Liferafts for the Eurocopter AS355E, F, F1, F2, N & NP models. Apical’s Eurocopter AS355 Cylindrical Emergency Float Systems are the only float systems certified for take-off after a water landing for the Eurocopter AS355. The systems are also available with 2 / six man liferafts integrated into the Aft Floats. The patented integrated design of the Apical Liferaft system conserves valuable passenger space and provides a significant safety benefit over cabin mounted options. The mechanical inflation systems for the floats and liferafts have no squibs or electrical components. The cylinder/valve assemblies, floats and liferafts are available as exchange items, thereby reducing maintenance and down time. All float chambers come standard with field replaceable pressure relief and inflation valves. The float retirement is on-condition rather than a life limit. Additionally, annual inspection of floats, as compared with six month inspection required in some competitors’ products, lowers ongoing maintenance costs of the systems. The Eurocopter AS355 Ecureuil 2 (Twin Squirrel) is a twin-engine light helicopter originally manufactured by Aérospatiale (now part of Eurocopter Group). 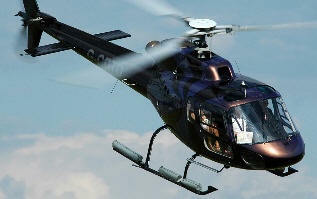 The AS355 is marketed in North America as the TwinStar. Development began in the early 1970s to replace the Alouette II, and the first flight took place on 27 June 1974. A twin-engined version, known as the Ecureuil 2, Twin Squirrel, or in North America as the TwinStar, first flew on 28 September 1979. Despite the introduction of the EC130, production of the Eurocopter AS350 and AS355, and the AS550 and AS555 Fennec military versions remains strong. Both single and twin-engined versions have been built under license by Helibras in Brazil. DART Helicopter Services LLC. is a privately held company whose primary focus is developing innovative STC’d products and creating sales networks for aerospace manufacturers who are looking to benefit from DART’s global marketing network and sales channel. DART is one of the logical choice for rotary wing operators who are seeking a supplier with a comprehensive product line and superior customer support.